The report said that doctors' ties can trail into wounds, infecting patients. DOCTORS have been told to stop wearing ties and white coats, amid fears that they could spread superbugs, such as MRSA. Ties, previously regarded as a mark of professionalism, have been condemned in a new report because they are rarely washed and can trail into wounds, passing infections. And, despite being held as a symbol of cleanliness since the 19th century, white coats are in fact unnecessary items of clothing, the study found. They are also often not washed for days and provide another surface on which bacteria can multiply. In the report on avoiding healthcare-associated infections (HCAIs), the British Medical Association advised doctors and nurses to abandon neckwear, coats and any other "functionless" clothes in favour of freshly laundered, simple outfits. Guidelines drawn up by the BMA's board of science also emphasised the importance of basic hygiene, such as hand-washing and clean equipment. To avoid infections such as clostridium difficile, a superbug that thrives in the stomach once good bacteria have been killed off, doctors are also advised to avoid giving antibiotics to the "worried well". Hospital-acquired infections are responsible for the deaths of about 400 people in Scotland every year. Dr Vivien Nathanson, the head of the BMA science and ethics committee, said it was time for doctors to take more responsibility for keeping hospitals clean. "There is a lot more that doctors, nurses, cleaners, patients and their visitors could be doing to reduce infections spreading," she said. "Around 15 to 30 per cent of HCAIs are preventable." Visitors, who have been advised in the past to refrain from bringing gifts and flowers that may spread infection, were also told to ensure hands and clothes are clean. But the main danger identified was ties, which can dangle dangerously close to wounds. Dr Nathanson added: "Ties are an unnecessary piece of clothing. We recognise that people touch their ties and wear them for a long time. People have to recognise the potential danger." 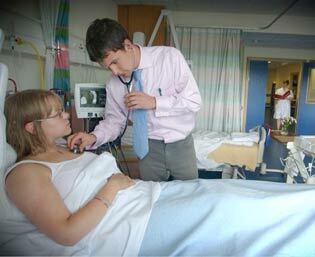 Dr Peter Bennie, of the BMA consultants' committee in Scotland, said older patients may expect doctors to wear a tie. "However, it is only a matter of time before patients realise that a more casual look is safer. There maybe needs to be a balance struck between expecting doctors to wear a tie as a professional and thinking about the health-care issues," he said. "We might see a sea change over the next ten to 20 years, where patients are more concerned than reassured when they see a doctor wearing a tie." Superbugs, which are resistant to antibiotics, are on the increase in hospitals because of the rise in using interventions in medicine, more vulnerable patients and the increased use of antibiotics. Methicillin-resistant staphylococcus aureus (MRSA) was a direct cause of 42 deaths in Scotland in 2004, while clostridium difficile, a virulent stomach bug, was responsible for 98. Dr Bennie said people who demand antibiotics for colds, even though the drugs cannot help a viral infection, must be refused. "Every time antibiotics are used where they are not needed, it increases the chance of superbugs developing which are resistant to antibiotics," he said. The report warned that life-saving technology, such as catheters, tubes and drains, can become "life-threatening" if they are not kept clean. It advised intervening only when necessary and using proven methods to avoid infection. However, not all the responsibility was on doctors. Health policy that has decreased bed numbers while increasing patient turnover to meet performance targets was also blamed. The drop in the number of cleaners was also cited as causing a rise in infections. The report recommended a "multi-dimensional" approach by both individuals and institutions to tackle the problem. But it concluded that ultimately, although there was no single solution, the most effective thing patients, staff and visitors can do is wash their hands.